Dwarf form of a trouble-free native shrub. July to August blooms are fragrant and long-lasting. The shiny dark green foliage turns yellow to gold in the fall. 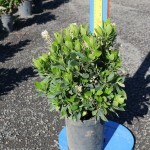 Does well in shade or wet soils. It has performed well in many locations. 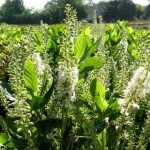 Use in a shrub border, a naturalized area, or in wet areas such as along a stream bank.